7 Best Ballet Barre for Home Reviews: Portable & Freestanding in 2019! Did you know that professional ballerinas are not the only ones who use barres for their trainings? In fact, anybody can use them. In case of pilates, stretching or dancing is your thing, a free-standing ballet barre is quite handy. Below, you will find 7 reviews to choose the best ballet barre for home so that you could pick up a perfect item to meet your needs. A ballet barre is a crucial part of every ballerina’s training routine. And, in fact, not only ballerina’s! Dancers and other fitness zealots are widely encouraged to use these handrails as well in the same easy and effective way. Ballet, as we know it today, first started to take its shape during the 15th and 16th centuries, but yet it had a very long way to go. The word itself originates from French and stands for a diminutive for a “dance”. Though, of course, the etymology of the word can be traced back even farther. And, basically, at first, ballet had been a type of a court dance performed by the aristocracy that later evolved in a separate art performed on stage by the specially trained dancers. Louis XIV of France was the one to popularize ballet in the 17th century. Not only he himself participated in some performances – Louis XIV as well supported the dance academia where professional male dancers were trained. As a matter of fact, even though today ballet is seen mostly as a woman’s and generally very feminine thing, first professional dancers, just like any other professional theatrical performers, were male. Think of the ancient Greek theater or Elizabethan theater in England – back then, all of the actors were male and no woman was allowed on stage. In ballet, the focus began to shift from the male to the female dancers only after the 19th century, although men were always welcome. At that time, the Romantic movement was gaining pace, and no romantic story is complete without introducing male and female performers, and ballet was no exception. So don’t worry – dance is for everyone, even for powerlifters! Of course, you don’t have to wear a tutu, but if it helps you to get in the right mood, then go for it! The year is 2018 for Christ’s sake – anyone can wear anything! And as for the ballet rails, it is not quite known how and why the first ballet handrails came into use, but the fact is still a fact – today no dance or fitness studio can operate without them. And that’s understandable since the rails provide the necessary support not only during the plies or pulses or any other type of exercise – they are much more convenient to use for stretchings. And that is definitely a realm not exclusive to the ballerinas. Here are 3 things you need to know before you will finally get to find your own barre for home use! What is a home ballet handrail? Basically, it is a horizontal rail that allows you to keep balance during your home trainings and can be easily moved around the house. If you’ve ever used a chair in order not to tumble down during your exercises, you know what I mean. The barre is also more advantageous because not only does it look better than a chair, it is usually designed in a way that neither you or the barre could tilt during the workout, unlike the chair that can easily slip from under your hand. How tall should a ballet barre be? Depending on how tall you are! The general rule is that the horizontal barre should fall between your hip and your waistline. A perfect handrail is a rare beast, and in case it’s been ages since you’ve started looking for a perfect stand, consider a folding ballet barre. Usually, they can be adjusted allowing making the construction’s legs longer or shorter according to your preferences and comfort. It is also convenient if you are not the sole user of the stand and other members of your family want to use it, too. On average, the standard length of the rail is 4′. This allows 2 people working at it simultaneously, and if you use both sides – even 4. There are two types of barres: fixed and portable. In this article, we will be talking mostly about the portable ones, and that is because they are obviously the best option for home use. In term of the rails, the portable rails tend to come in two shapes: a single or a double. The latter is good for stretching and can also be a great option if you have kids who also show interest in joining you during your workouts. Plus, you can adjust both of the barres to different levels so that you don’t have to readjust them when starting a new exercise where uneven rails are required. Recently, the PVC handrails have to begun to gain popularity, but earlier it was all about metal and wood. Plastic is lighter and can cost less, but are they as long-lasting and safe as those mentioned above? On the other hand, wooden barres can get harsh or crack, and metal ones can be cold to the touch or really heavy. But the first is pretty easy to fix, and the latter – because of the weight, makes it near to impossible to tilt and injure yourself. As for the coldness, oh well. You will have to get used to it, that it. Of course, each material has it pros and cons, but in this article, I will walk you through mainly aluminum and wooden rails. Vita Vibe’s barres are perhaps the most accessible items among the products falling under the category of fair-priced and steady. And this strong aluminum portable ballet barre is exactly what you need for your daily workouts. It is a foldable construction, which means that you can basically build your own ballet barre yourself! It is also long enough, so that several people can use it simultaneously. You can as well adjust the rails to different heights, so that you don’t need to reset them every time you begin a new exercise! The stand features the non-skid feet for better balance. In case you were looking for the sturdiest cheap ballet barre, it is my pleasure to tell you that this one is the perfect item you’ve been looking for. It literally has no imperfections! 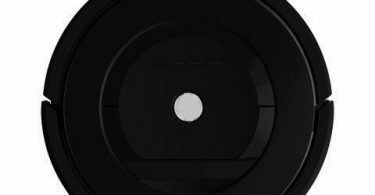 One more outstanding Vita Vibe product. This freestanding handrail is adjustable as well and takes only a few minutes to assemble. 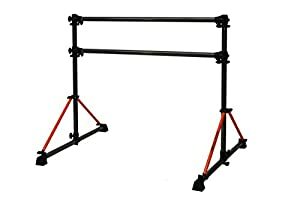 The stand is great for home and can be used in a dance class just as efficiently. This is an aluminum portable ballet barre with rubber caps on the feet for exceptional stability and adjustable rails to enhance your experience. The construction is 5 feet long which is enough to let up to 4 people work simultaneously without distracting each other. Although the construction is sturdy, the joints may begin to wear out pretty quickly if you are going to use it for heavy daily trainings. But if you are looking for something lightweight, this handrail is exactly what you need. Aren’t you yet convinced that Vita Vibe manufactures the best ballet barres for home use? Look what a vast variety of options they offer! This portable single handrail will serve you fairly for a long time. It doesn’t occupy much space, is very easy to assemble and store. This barre is made of aluminum and features a special anti-microbial, powder-coated satin silver finish that allows not only enjoyable, but safe workouts. The rail is 4 feet long and 1.5″ in diameter. The feet feature non-slip protective rubber caps to prevent the stand from ruining the floor and tipping over. The stand is durable but may feel a bit too lightweight if you are used to the fixed or heavier handrails. Also, the clamps might begin to loosen, if the barre is subject to the heavy daily workout. This portable workout set is a miracle. 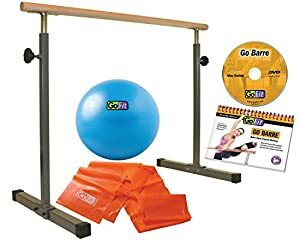 Not only will you get a marvelous and sturdy handrail for exercising, but you’ll also receive a DVD from which you can get tips and advice how to perfect your workouts, an exercise ball, and my favorite one – a flat band. The latter can be applied both using the rail and without it, and both options are great for sculpting your body. The stand features a single 4-feet hardwood rail that is 1.5″ in diameter. Adjust the height up to 54″. The two knobs on the legs will hold the rail securely in place. Some customers have reported that minor issues may occur with the nuts while assembling the stand. Other than that, the item is sturdy and will last as long as you walk and breathe on this planet. 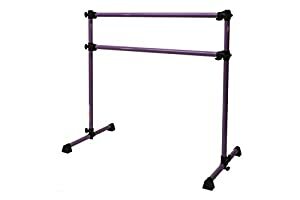 This freestanding rail is literally terrific for both dancing and fitness exercises. Lightweight and steady, this portable ballet barre will turn your workouts into a breeze. The stand is available in several colors. The stand is made of durable aluminum, while horizontal barres are sanded wood ash. The rails are adjustable, so you can change their height for the maximum of your comfort. The feet are equipped with anti-slip rubber caps so that the rail does not tilt and doesn’t damage the floor. The diameter of the handle is 1-1/2″ which makes it convenient even for smaller hands. Sometimes, depending on how hard you work on the bar, the clamps can get a bit loose. But the issue can be solved with help of the basic quick-fix tools – just tighten them up and you are good to go! 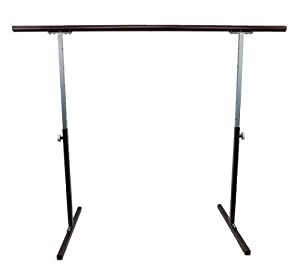 Soft Touch knows how to make portable ballet barres. Minimalistic and stylish, this model features a single rail, is nice to the touch, strong, and steady. Can it become your best portable ballet barre? Let’s take a closer look at this beautiful piece of equipment every dancer has to have. The stand has bronze powdered finish and features non-skid rubber caps on the feet to prevent tilting. The diameter of the rail is 1.5″ which makes it an excellent choice for any hand. Pilates, dancing or ballet practice – this beautiful stand can serve anybody! Although it is strong and very easy to assemble, the barre’s coating may come off, revealing naked metal. Not the best thing to experience to have during the workout! But don’t worry, that can occur only if the coating layer is damaged, which is really hard to achieve! 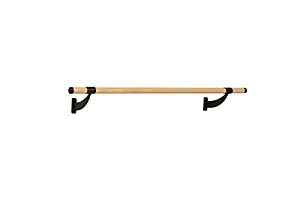 Now technically, this one is not a portable ballet barre, unless you like mounting and dismounting your rail each time before and after you start exercising. This wooden handrail is for those who have enough room to practice and are sure to use it regularly and as intended. But, of course, no one will judge you if you use this beautiful rail for hanging your clothes or other belongings, although it might be a pity. The 4-feet handrail is made of hardwood ash and is 1.5″ in diameter. The mounting brackets are made of steel and are about 7″ between the wall and the actual rail. Don’t worry, the barre won’t come off the wall (well, unless you have installed it poorly!) Other than that, it is a strong and durable item that will serve you for ages. Since this is not an adjustable rail, make sure you’ve measured the height properly. Otherwise, you can spoil both your experience and the wall. Also, over time the end caps might become a bit lose. To secure the caps, use extra screws. A ballet barre is an essential part of every ballet dancer’s routine. Of course, if you’re practicing at home or just don’t have a goal of becoming a professional dancer, you may use a chair, a drawer or anything else to keep the balance, but it feels like working out in a cocktail dress or a tuxedo – possible but uncomfortable. Same applies to stretch, fitness, pilates or any other kind of dance. The handrail is there for two purposes: to provide support and add to the discipline. Yes, discipline — exactly! Remember what I’ve said about the cocktail dress? 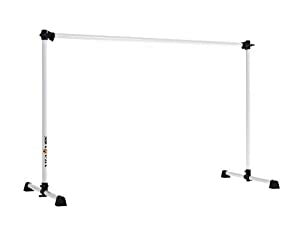 Also, it is essential to remember that these portable dancing rails are no good for gymnastics. Surely, the dancing rails provide support and help the trainees to keep their balance, but are not sturdy and steady enough for complex stunts. They may seem like a reasonable option for a kid, for instance, but they are not. If you are searching for the barres for a kid who is practicing gymnastics, for safety purposes, choose the equipment designed specifically for gymnasts. So, as you can see, there is a whole world of ballet handrails out there. A wooden or a metal one? Double-railed or with a single bar? Fixed or portable? The market indeed offers a great variety of products, and your task is to choose the one that will work best for you. This last bit is for the male readers. Guys, if ballet or dancing is your life-long passions don’t hesitate to purchase one of these remarkable handrails to assist you in your training! If you are a newbie, it is even more desirable for you to have one, since dancing requires some moves that are unnatural to the body and can be really hard to master without some extra support. Let yourself become not only fit but gracious! Ballet and dance, in general, are two of the most effective activities to help you perfect both your body and mind. Even the basic moves are beneficial for the overall body improvement. Again, think of pilates and general fitness training – both of them include some of the ballet moves. Hope you’ve found this article useful! Let me know what the best ballet barre for the home means to you? Don’t hesitate to leave your comments in the section below and feel free to share your thoughts and experience with the world! I have been looking into getting a barre for my workout room but my husband is afraid that it will get in the way. I told him I could get a portable one so it can be moved out of the way when trying to use the other equipment but it would definitely work better for our space to just get one installed. Do you recommend getting a stationary one? Sure, stationary ballet barre will be a good choice. The only downside of this purchase is that you can’t obviously move it. 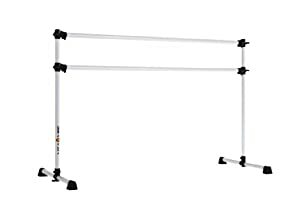 I was going to buy one of these barres to put in my basement to use on occasion but it is always so cold down there that I think that a metal rail would always be too cold and discourage me from using it. Would wood be better for a cold area like that? Or would it also get really cold? I am trying to get myself back into the kind of shape I used to be in when I danced ballet! It really is a tough dance to even be relatively okay at. I had a portable bar when I was much longer but I have since gotten rid of it. Since I’m in college I need to be thinking about getting the cheap one just to make sure I stick with it. Which one is the cheapest? Outdoor Ceiling Fans: Which One Is Best To Choose?